Preheat oven to 350°F. 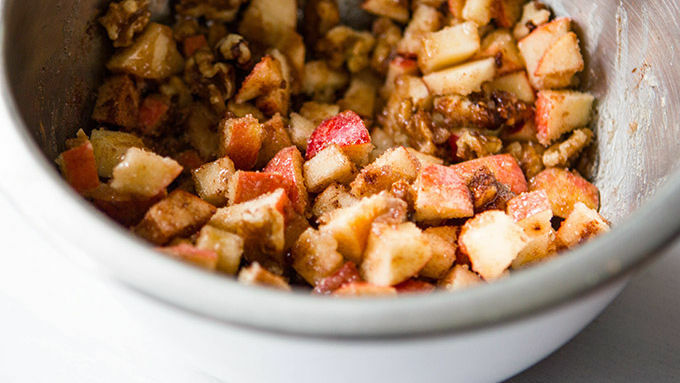 In a large bowl, stir together diced apples, brown sugar, nuts, cinnamon and butter. Open one tube of Grands! and roll each cinnamon roll flat until about 1/4-inch thick. 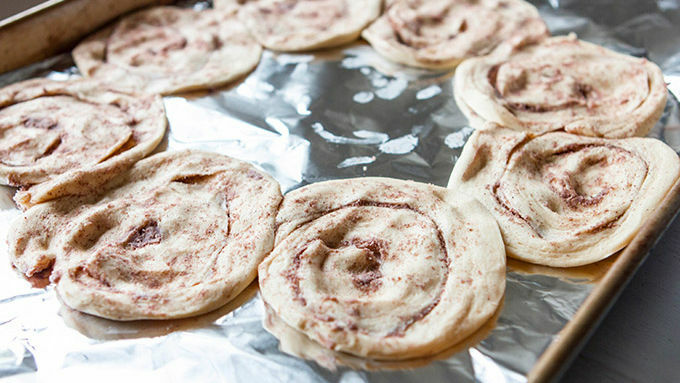 Line a large pizza baking dish with parchment paper, then arrange the rolled out cinnamon rolls in a circle on top of the parchment. Each circle of dough should overlap slightly. Press the edges together where the cinnamon rolls overlap. Spoon the diced apples down the middle of the cinnamon rolls in the ring. Open the second tube of cinnamon rolls. Roll out each cinnamon roll until 1/4-inch thick, then lay the rolled out rolls on top of the apple mixture, lining each of the top-layer cinnamon roll up with each of the bottom-layer rolls. With a fork or your fingers, gently press the edges of each matching top and bottom cinnamon roll together. Bake in preheated oven for 20-25 minutes or until the party ring is golden brown. Remove and cool slightly before gently transferring to a serving platter. 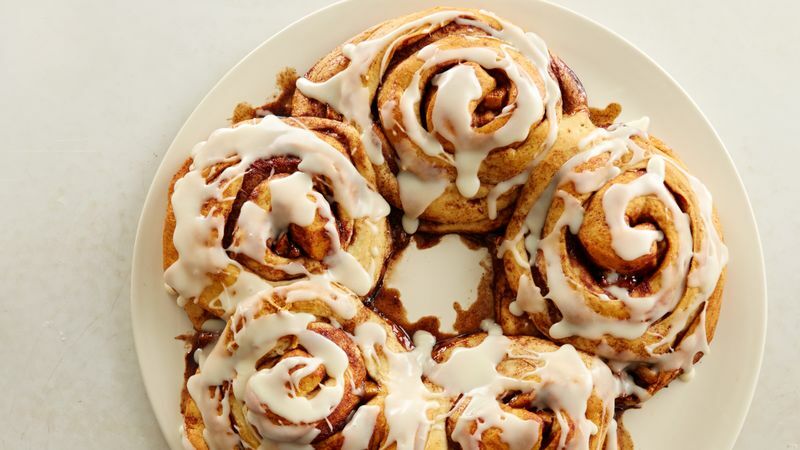 Drizzle with the icing included in the cinnamon roll packages. Serve warm or at room temperature. When you’re having a party, there’s only one thing to do – pull out the purtiest recipe you’ve got in your pocket and wow your friends. This recipe is one of those recipes. The ones that have all the girls exclaiming, “How DO you do it?” You’ll coyly tuck a stray hair behind your ear, bat eyelashes, and say, “Oh, really. This? It’s positively nothing.” And you’ll mean it. Because this splendid recipe is easy easy easy. 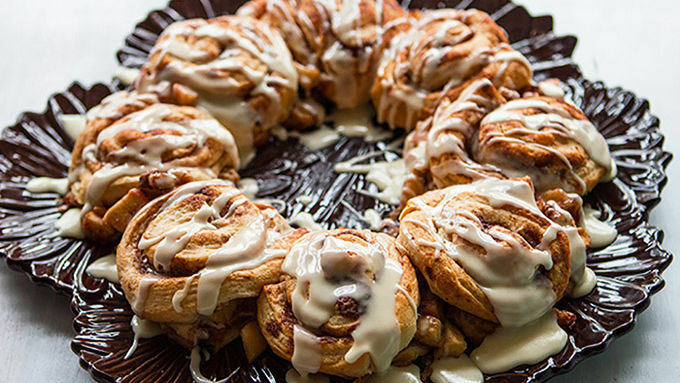 So easy, in fact, that you can plumb near forget you’re having a party, then pull together this Pinterest-worthy apple cinnamon roll ring in less than 30. Note: I specified using parchment paper because I did not use parchment, and SO wished I had. Parchment paper will prevent your ring from sticking and you don't want to ruin your gorgeous party ring! Second note: if the cinnamon rolls are sticking to your wooden rolling pin, just spray the tops of them with an eeny weeny bit of nonstick spray. You’ll get a gorgeous ring that looks like apple-stuffed cinnamon rolls, and tastes like apple-stuffed cinnamon rolls, and makes you want to live in an apple-stuffed cinnamon roll. Drizzle it with the included Cinnabon icing. Devour.